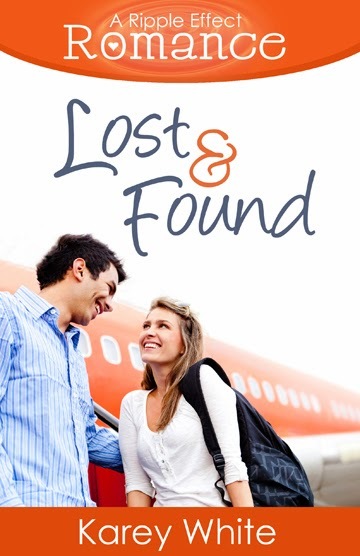 Lost and Found is the 4th book in the Ripple Effect Romance Series. Each book is written by a different author and contains a character from the previous book. This book has the story of Lydia, Jace’s sister. Lydia has spent the summer in Jace’s girlfriend’s condo in Charlotte. It was supposed to be her big adventure since she’s a girl who lives her life pretty quietly in Bridger, CO. You can take the quiet girl from a quiet town and put her in a big city, but that doesn’t always mean she’s going to break out of her shell and have a big adventure! So when Lydia is sitting at the airport waiting to fly home, she’s lamenting the fact that her only adventure in Charlotte was spending the summer reading on the roof of the condo. Reading about other people’s adventures. All that changes when she meets Blake at the airport. He tells her that he’s been in Charlotte searching for his grandfather’s legacy to him….with no luck! Fortunately, their flight is cancelled and they decide to take on searching for the legacy together. What follows is 2 days filled with adventure and romance. Lydia takes more risks in those 2 days that she has all summer. And what Blake finds from his grandfather changes the course of his workaholic life. This is another winner! I am loving this series! Lost and Found is the second book I’ve read by Karey White. She’s great. This is a sweet, clean romance. Just the kind I like! It’s a quick read and leaves you with a warm fuzzy feeling. I highly recommend it! Karey is a USA Today best-selling author. She grew up in Utah, Idaho, Oregon, and Missouri. She attended Ricks College and Brigham Young University. Her first novel, Gifted, was a Whitney Award Finalist. She loves to travel, read, cook, and spend time with family and friends. She and her husband are the parents of four wonderful children.